False-color micrographs of various coronaviruses, including the viruses for severe acute respiratory syndrome (SARS-CoV) and middle east respiratory syndrome (MERS-CoV). These viruses are roughly spherical, and display a characteristic “crown” of proteins that decorate the surfaces of the virus particles. Source: NIAID. In mid-November of 2002, a few farmers in the Guangdong province of China began falling ill with pneumonia-like symptoms. This was not necessarily out of the ordinary for the region, but the disease spread rapidly, infecting some 806 people and killing 34 by mid-February of 20031. A doctor from Guangdong who had treated some of these mysterious cases traveled to nearby Hong Kong on February 21, 2003 for a wedding. Four days before, a 33-year-old man staying with his brother in Block E of the massive Amoy Gardens housing complex in Hong Kong died of unknown causes. Within a few weeks, 329 residents of Amoy Gardens became infected (42 of whom died), in addition to numerous individuals who had stayed on the same hotel floor as the Guangdong doctor in late February2. These hotel patrons—who by now had returned to their homes in Taiwan, Vietnam, Canada, and a number of other countries—carried with them a disease that would have the potential to cause a worldwide epidemic. By the time the World Health Organization declared that the outbreak was contained on July 5, 2003, the severe acute respiratory syndrome coronavirus (SARS-CoV) had infected 8273 people, killed 775, and cost an estimated US $40 billion in economic losses throughout the world3. SARS-CoV, belonging to the same family of viruses that cause the common cold, likely emerged in Guangdong animal markets, where bats, Himalayan palm civets, and people—each of which is a natural reservoir for a member of the coronavirus family—interacted in close quarters with one another4. What caused SARS-CoV to evolve at the time that it did? Why was it so virulent, when its cousin—the common cold—causes nothing more than a runny nose and a sore throat in the vast majority of cases? Researchers still do not know the full answer, but beginning to answer this question requires an understanding of how and why viruses evolve. Viruses’ evolutionary patterns are unique among biological entities because they are non-living. In fact, viruses do not evolve; they evolve through the cells they infect, dependent on the replication machinery of their hosts to transmit their genes on to the next generation. The evolutionary origins of viruses is also unique among biological systems and is hotly debated among researchers today. Regardless of their evolutionary origins, however, viruses evolve by two major mechanisms: mutation during genome replication and horizontal gene transfer, a phenomenon by which genetic information is exchanged from one existing virus (or host cell) to another existing virus, rather than being transmitted from one generation to the next. Mutation rates vary considerably among virus species for reasons that are not well understood, while horizontal gene transfer may play an important role in the virus’s interactions with the host. In any case, as for all biological entities that interact with other organisms—whether living or not, and regardless of how they evolved in the first place—the evolutionary story of viruses is one of tradeoffs and checks and balances, that limit what is possible for viruses to do. In other words, viruses have many tricks up their sleeves, but we might be able to predict what they will do next by having a solid understanding of these tradeoffs. All of this understanding, in addition to shedding light on the weird and fabulous world of viral biology, will be crucial for predicting future viral epidemics and formulating public health interventions that anticipate those events. False-color micrographs of a coronavirus. Source: NIAID. In common parlance—and even among most virologists—it is common to discuss viruses as organisms that evolve just like cats, dogs, plants, people, archaea, and bacteria. And this is for good reason: epidemiologists want to understand the pressures of natural selection that might cause the influenza virus to hop hosts from birds to humans, or that might cause the Zika virus to become more virulent. But this kind of vocabulary overlooks an important aspect of viruses that informs their evolution: viruses are not alive. The definition of life is an unresolved question, but most contemporary researchers agree that living organisms must be metabolically active—that is, they can eat and convert energy from one form to another. They must also be capable of reproducing themselves. The basic unit of life, then, is the cell, which includes bacteria, plant, and animal cells. Viruses are not like living cells. They are not metabolically active; they do not consume energy. Because of this, they are only capable of reproducing themselves using the replication machinery of living cells, be they bacteria, plant cells, or human cells (all of which are susceptible to viral infection). The fact that viruses are non-living has profound implications on the way they evolve; without living cells to copy the virus’s own genetic information and generate new virus particles, the virus itself could not evolve5. This means that viral genomes change over time because the cells that viruses infect have some incentive to mutate the viral genome. This incentive, of course, is for the cell to avoid becoming infected. Thus as long as there are cells, there will be viruses that are continually evolved to infect them. If viruses were truly living, as are plants and people and bacteria and other living cells, all viruses that exist today would have been derived from a single common ancestor. Just as an early cell, some three and a half billion years ago, gave rise to all living organisms that exist today, an early virus would have given rise to all the viral species that we now find on the planet. In support of this theory, viral capsids—the molecular envelopes that package the virus’s genetic material—take on a remarkably small number of shapes6. This suggests that capsid shape is a trait that has been passed on from virus generation to generation—with little variation—since the earliest evolutionary times. However, an opposing theory suggests that new viral species can emerge not just by evolution from a single ancestor, but also by “gene escape” events in which the right collection of genes escapes a living cell, acquires a molecular envelope, and transforms itself into a virus that can infect living organisms. Indeed, such an event is thought to have spawned the human Hepatitis Delta Virus, formed when a DNA sequence coding for a molecule called a ribozyme jumped ship from the human genome and eventually became part of a virus7. So which is it: were viruses all evolved by living cells from a common ancestor, just like plants and animals, or do they arise spontaneously as a result of gene escape events? In fact, both theories are probably true. It would be unreasonable to posit that virus families do not have some kind of lineage as do living cells (otherwise, how would we know that SARS-CoV is related to the common cold virus? ), but not impossible to propose that each of those families arose as a result of independent gene escape events. Because of this dual origin of viruses, researchers and public health actors need to take a two-pronged approach to predicting and managing viral epidemics. Known human viruses need to be closely monitored lest they emerge unexpectedly, while researchers need to better understand how new virus species can form from the genetic material that already exists in living cells. Public health actors cannot discount the possibility that, even with all the possible interventions in place to combat known viruses, new viral species could emerge as a result of these mechanisms. Perhaps because they hijack the machinery of living cells to replicate their own genomes, viruses change their genomes using mechanisms that are identical to those in cells. The two major mechanisms by which viruses acquire changes in their genomes are mutations that arise during DNA replication and horizontal gene transfer. Every living organism must make copies of its genome to reproduce, and so every living organism has genome replication machinery to carry out this task. Viruses reproduce by hacking these replication machines to produce not the host cell’s genome, but the virus’s own genome. Some viruses even have their own replication machinery encoded within their genome, but they still rely on the host cell’s protein building machinery to build those replication machines. Any copying process is subject to error, and it is this error-prone copying process that allows viruses to acquire mutations in their genomes that might give them an advantage over other virus particles, driving natural selection and evolution. Different types of viruses have different mutation rates: Viruses that use DNA as their genetic material have error rates that are often on par with their DNA-replicating hosts. Viruses that use RNA—a molecule very similar to DNA—as their genetic material have error rates anywhere from 100 to 10,000 times higher than that of DNA viruses8. Whereas vertical gene transmission (right) occurs by passing genes from one generation of cells onto another, horizontal gene transfer (HGT, left) takes place when an existing cell or virus acquires DNA (red squiggle) from another source. HGT allows biological entities to acquire potentially useful genes that don’t already exist in their genome. Source: Gregorius Pilosus. Another way that viruses can change their genomes is through a mechanism known as horizontal gene transfer (HGT), which involves moving a chunk of genetic material from one biological entity to another, rather than replicating the chunk. Far from unique to viruses, HGT is an important feature in the evolution of bacteria (including those that cause tuberculosis and most infections that take place during surgery), which often exchange antibiotic resistance genes through HGT to resist getting killed by medicines9. Viruses can engage in HGT as both the recipients of a gene from a living organism, or as donors of a gene to a living cell (indeed, viral infection itself is a form of HGT). They can also engage in HGT events that take place between two viruses. In bacteria, HGT can mediate the rapid spread of antibiotic resistance genes across diverse bacterial species, rendering most antibiotics useless for treating disease within three or four years of their introduction in the market. HGT in viruses is less well understood, but it is easy to imagine that genes that play a role in virulence or host range could rapidly spread across virus populations if sufficient evolutionary pressure was placed on them to do so. When developing new treatments for viral diseases, then, researchers need to be mindful of how viruses could circumvent those treatments. If a virus were to develop resistance to the treatment via mutations during replication, it might be able to rapidly disseminate that resistance gene to other viruses within the body of a patient who is undergoing treatment. Despite being error-prone, non-living biological entities that are evolved by the cells they infect, viruses follow exactly the same rules of evolution as other living organisms; this means that their evolution is a history of tradeoffs. Because of genetic or environmental constraints, the evolution of one trait in an organism is often linked with the evolution of another. The basis for these tradeoffs is genetic: often, one gene has multiple functions, and variations of that gene that make it better at performing one function will most likely make it worse at performing another function. One of the major tradeoffs which dictates the evolution of viruses is the virulence-transmission tradeoff. Viruses that are more virulent—that is, that can produce more viral particles at the expense of the host’s health and chance of survival—are less capable of transmitting to another host. This is because viruses that kill their hosts more rapidly give less of an opportunity to the host to interact with other uninfected individuals, and thus transmit the virus10. Another tradeoff that exists between viruses involves virulence and host range. Viruses that can infect a greater number of host species are less effective at reproducing in any one of them, since they must maintain a diverse arsenal of cell receptors and immune evasion strategies for each host. Tradeoffs limit the range of possibilities for the evolution of viruses (or any organism, for that matter). Even if a virus could acquire a gene that significantly increases virulence in humans by HGT, there is no guarantee that this virus would rapidly begin to spread and start an epidemic, since the gene might be involved in a tradeoff that affects the virus’s ability to perform other essential functions. Just as tradeoffs affect a virus’s balance between carrying out its essential functions and infecting new hosts, they also influence our ability to control virus spread through vaccination. The so-called “imperfect vaccines,” which provide only partial coverage against a pathogen, select for increased virulence by forcing viruses to evolve more aggressive infection cycles to combat the partial immunization. That is, such vaccines can afford to be on the more virulent side of the virulence-transmission tradeoff because increased virulence does not lead to less efficient transmission in partially immunized people. This may not affect those who are already immunized, but it means that the pathogen will be more aggressive—and thus more likely to kill—in individuals who are not immunized11. As researchers develop new imperfect vaccines for viral diseases, public health actors need to carefully manage the deployment of these interventions. By and large, even imperfect vaccines—whether against viruses, bacteria, or multicellular parasites—should be used frequently because they greatly reduce the prevalence of disease (as has been the case with the partial malaria vaccine), but officials will benefit from considering the long-term evolutionary consequences of these interventions12. So what caused SARS-CoV to emerge when it did, and to kill as effectively as it did? It will be very difficult (maybe even impossible) to know for sure, but the unique evolutionary story of viruses certainly played a role. Derived from other coronaviruses, SARS-CoV might have arisen as a result of HGT between existing viral species, and could have been evolved further by acquiring mutations through replication in its reservoir population (likely bats) before infecting humans. This unique genetic makeup placed SARS-CoV in a dangerous place on the virulence-transmission tradeoff with regards to human infection, since highly virulent pathogens can more easily spread throughout the increasingly interconnected human population. These factors—genetic mutation, horizontal gene transfer, evolutionary tradeoffs, human connections—are factors of life itself, and are sure to drive the evolution of viruses in the future. An awareness of the mechanisms through which viruses evolve is crucial to keeping the world’s population healthy and safe in the dynamic balance between cell and virus evolution. Colin Hemez is a junior in Ezra Stiles College majoring in biomedical engineering and art history. He can be contacted at colin.hemez@yale.edu. World Health Organization. (2003). Severe Acute Respiratory Syndrome (SARS) multi-country outbreak – Update 6. Retrieved from http://www.who.int/csr/don/2003_03_21/en/. World Health Organization. (2016) Update 95 – SARS: Chronology of a serial killer. Retrieved from http://www.who.int/csr/don/2003_07_04/en/. Knobler, S., Mahmoud, A., Lemon, S., Mack. A., & Oberholzer. K. (2004). Learning from SARS: Preparing for the Next Disease Outbreak. The National Academies Press. Holmes, E. C., & Rambaut, A. (2004). Viral evolution and the emergence of SARS coronavirus. Trans. R. Soc. Lond. B., 359, 1059-1065. Moreira, D., & Lopez-Garcia, P. (2009). Ten reasons to exclude viruses from the tree of life. Nature Reviews Microbiology, 7, 306-311. Holmes E. C. (2011). What does virus evolution tell us about virus origins? Virology, 85(11), 5247-5251. Salehi-Ashtiani, K., Luptak, A., Litovchick, A., & Szostak, J. W. (2006) A Genomewide Search for Ribozymes Reveals an HDV-Like Sequence in the Human CPEB3 Gene. Science, 313(5794), 1788-1792. Lauring, A. S., Frydman, J., & Andino, R. (2013). The role of mutational robustness in RNA virus evolution. Nature Reviews Microbiology, 11, 327-336. Ochman, H., Lawrence, J. G., & Griosman, E. A. (2000). Lateral gene transfer and the nature of bacterial innovation. Nature 405, 299-304. Goldhill, D. H., & Turner, P. E. (2014). The evolution of life history trade-offs in viruses. Opinion in Virology, 8, 79-84. Mackinnon, M. J., Gandon, S., & Read, A. F. (2008). Virulence evolution in response to vaccination: The case of malaria. Vaccine, 26(3), C42-C52. PATH Malaria Vaccine Initiative & GlaxoSmithKline. (2015). Efficacy and safety of RTS,S/AS01 malaria vaccine with or without a booster dose in infants and children in Africa: final results of a phase 3, individually randomised, controlled trial. The Lancet, 386(9988), 31-45. 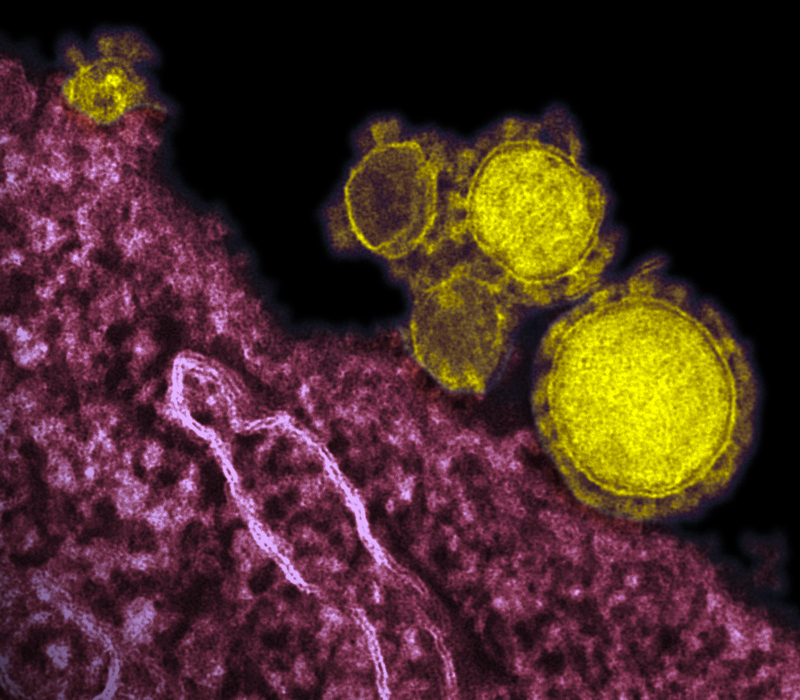 Alarmist Chinese coverage of MERS – Counterproductive?